(CNN) -- One of seven suspects charged with murder in the deaths of a Florida couple will be extradited from Alabama to Florida to stand trial, authorities said Monday. Donald Stallworth Jr. will plead not guilty to the slayings, his lawyer says. A warrant for Donald Stallworth Jr.'s extradition has been processed by governors' offices in Florida and Alabama and sent to the jail where he is being housed, Florida State Attorney Bill Eddins said. 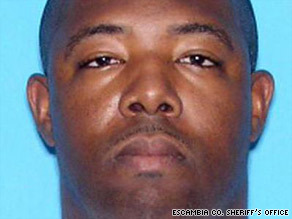 "At this time, he is ready to be transported back to Escambia County, Florida, to face double murder charges and home invasion robbery," the statement said, adding Stallworth would be transported "in the very near future." Stallworth faces charges in connection with the shooting deaths of Byrd and Melanie Billings on July 8. He is one of seven suspects charged with murder; an eighth person has been charged with being an accessory after the fact. Authorities have said the Billingses, who were known for adopting special-needs children, were killed during a home invasion robbery in Beulah, Florida. A small safe containing prescription medication, family documents and some jewelry was taken, and later found in the backyard of the eighth suspect, Pamela Wiggins, authorities have said. Two sources familiar with the investigation have told CNN that a second safe at the home contained at least $100,000. Police have described another suspect, Leonard Patrick Gonzalez Jr., as the organizer of the crime. Escambia County Sheriff David Morgan has said Gonzalez once worked for a car dealership Byrd Billings owned, and court documents state that Gonzalez received financial support from the family for a martial-arts studio he ran. An attorney representing the Billingses has said that Byrd Billings made a nominal donation to Gonzalez's karate charity. Stallworth's attorney, David White, said last week that his client would plead not guilty. The evidence against Stallworth is based solely on the word of another suspect who said he was at the crime scene, White said. It was not clear to which suspect White was referring. CNN's Aaron Cooper and Ross Levitt contributed to this report.